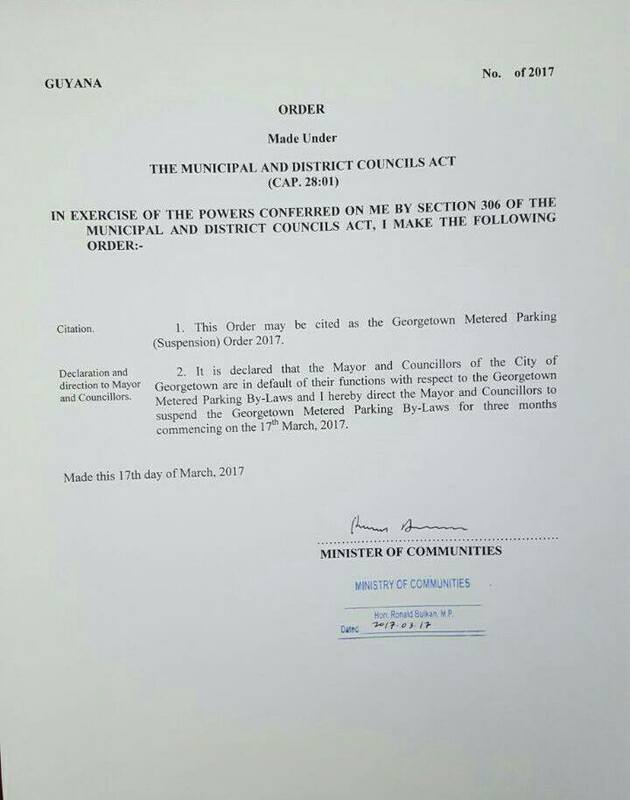 Minister of Communities, Ronald Bulkan on Friday immediately suspended metered parking in Georgetown for three months, a move that acting Mayor Sherod Duncan welcomed and announced that he would summon an extraordinary statutory Council meeting to ratify Cabinet’s decision. Suspension of the by-laws instead of the contract followed worry by Georgetown’s Town Clerk, Royston King that suspension of the deal itself could trigger a legal demand for hefty compensation in accordance with the contract. Bulkan’s issuing of the suspension order came several hours after Minister of State, Joseph Harmon announced that Cabinet wanted the metered parking suspended to allow for a renegotiation of the contract between City Hall and Smart City Solutuons in light of concerns by government, Georgetown’s citizenry and the wider Guyanese populace. Harmon said government was concerned that parking meters have been erected on streets for which the Ministry of Public Infrastructure rather than the municipality is responsible for. That Ministry on Thursday published a list of streets and roads for which it has responsibility and added that it has not granted permission to City Hall and Smart City Solutions to provide parking on them. Government is also concerned that SCS has used parapets which are not the Council’s property. Harmon added that other concerns include the fees being charged, financial arrangements for the project and no provision for the parking of police, fire and ambulatory services in areas of Georgetown. The contract says police, fire, medical and ambulances are exempt from parking meter fees only when the vehicles are parked in metered parking spaces in emergency performance of their duties. He suggests that Cabinet wants greater involvement of stakeholders in the process, and concerns expressed by citizens of Georgetown and Guyana generally. Acting Mayor Duncan said he intends to exercise his legal authority, on the advice of the Town Clerk, to call a special council meeting to “allow for a full deliberation and a decision by the Council.” He welcomed recent developments with a view to resolve the prolonged controversy that has spilled over into the streets of Georgetown with weekly protests near City Hall by the Movement Against Parking Meters (MAPM). “I believe that in all instances our government has exercised strategic patience, holding to the view that Central Government should sparingly insert itself into Local Government matters, but instead allow the full measure of the democratic process to be engaged whether in rigorous debates at the level of the Council or a robust democratic engagement through lawful protests,” said Duncan, of the Alliance For Change (AFC), who is the architect of opposition against the M&CC-SCS parking meter agreement. Harmon, whose A Partnership for National Unity (APNU) holds 24 of the 30 Council seats, said Friday that he expected City Hall to abide by central government’s wishes. The AFC had in early February publicly called for metered parking to be suspended to allow for a full reconsideration against the background of reviews of the contract by the Ministry of Finance and the Ministry of Legal Affairs. MAPM, among other interest groups and organisations, continue to insist on the revocation of the entire contract.